Jane likes to look smart when she’s out and about. Today she’s feeling stylish too, in her winter coat and matching hat. Jane is ready to catch a train into town and meet her friends for lunch!! Tilda Doll Jane is knitted flat. She is worked from the head down and the stitches are divided to form the legs. Her arms are knitted separately and are sewn on. Janes hat is removable although her coat is sewn on. Her coat and hat are decorated with a simple moss stitch hem and edging. I have included a photo tutorial to show you an easy way to apply Tilda style hair. 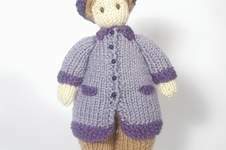 This pattern is suitable for confident beginners- The doll and her clothes are knitted flat and use basic shaping. I also explain the SSK stitch for those who may not be familiar with it. Tilda Jane is suitable both as a decorative item and as a toy for children to enjoy- If you are making Jane as a gift for a child, for safety reasons, please substitute French knots for the buttons on the coat.